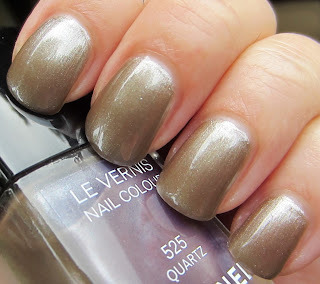 I knew when I saw the promo pictures for Chanel's Fall 2011 Collection, ILLUSIONS D’OMBRES DE CHANEL, that I'd be buying more than just the nail colors! Naturally, today is cloudy and rainy, but I hope my overcast photos will still show you how beautiful everything is. Graphite is a favorite from this collection for many people, and it is indeed a lovely shade. 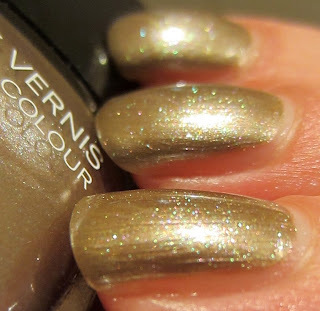 This pewter shade with mainly gold glitter has a slight green hue to it in certain lighting. I love how defined the glitter appears against the base background. All three shades from this collection have a very nice formula, and I used two coats. All shades were photographed indoors with no flash, and outdoors under cloudy skies. 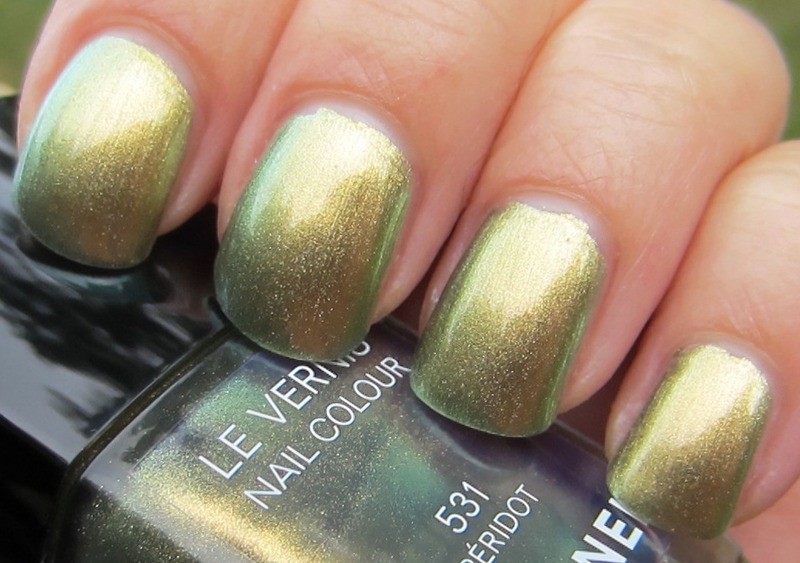 Peridot is a deep golden green duo chrome. It's not a bright gold, but more of an antique gold. These photos are a mix of indoor and outdoor (clouds), and I can only imagine how pretty this is in full sun. Quartz didn't move me either way when I saw the promo pictures, but I thought as long as I loved the looks of the other two shades, I'd give this one a chance. 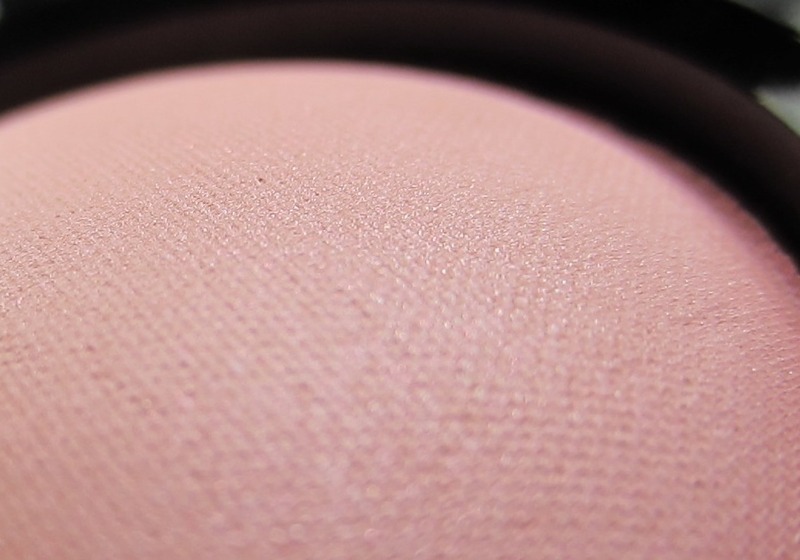 This medium taupey champagne shade easily won me over when I saw that it had blue shimmer, which I hadn't noticed until I saw it in real life. 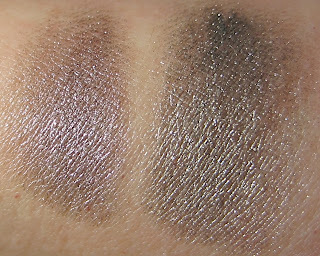 Easily intrigued by textures, I was more than curious about the Long Wear Luminous Eyeshadows in this collection. 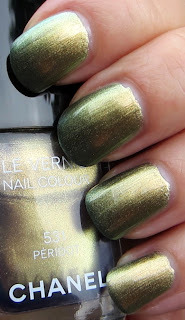 I chose Illusoire (smoky plum) and Epatant (deep pewter green). These have a very unique texture, and are a cross between a gel and a powder. They look like a powder, but when you press on them, they indent and then spring back. They're not only gorgeous, but entertaining to play with! 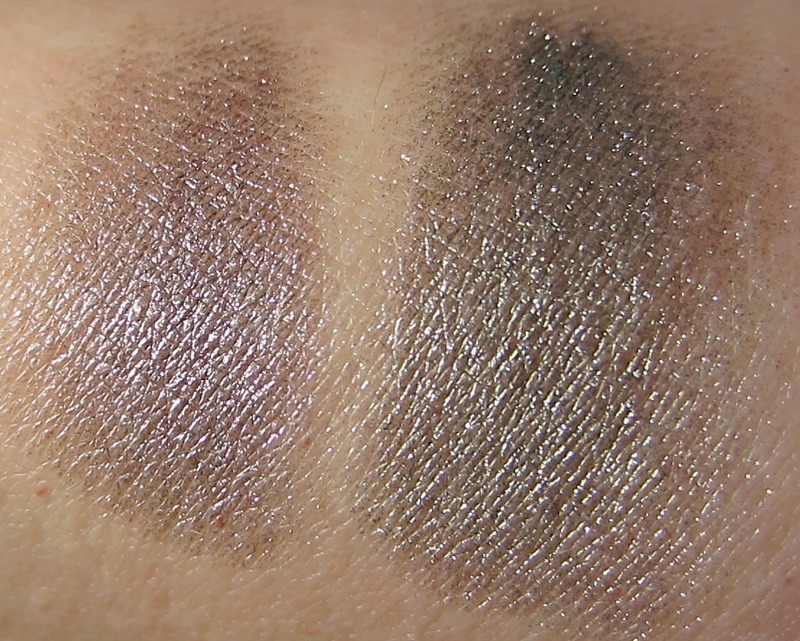 Above shows them swatched on paper, and below is a very light swatch on my skin. These are very pigmented, so they build up quite easily. 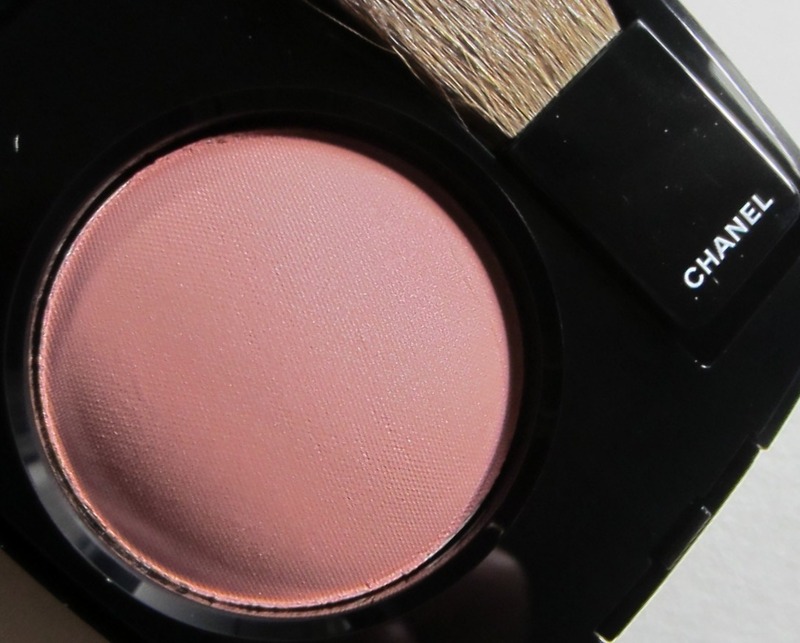 I also picked up the Rose Ecrin Joues Contraste Powder Blush, because it looked like a universally nice shade. This medium rose tone is so smooth and very finely milled. It has a delicate rose scent, and the slightest touch of gold shimmer. I'm very happy with the products I selected from this collection. I love everything, and I'm resisting the urge to pick up a few more of the eye shadows. I'm not sure if I want them because they are so pretty and apply/wear well, or if it's just because I want to press on them and watch them spring back to their original form! Graphite and Peridot are gorgeous colors!! I am pretty sure I need that blush!! I love Peridot, I admit it's neat! I love your nail polish colors! In the beginning I thought Peridot was THE color, now I think that I would prefer Graphite (I'm trying to persuade my hubby to buy it for me as a bday present)! I passed on the whole Peridot thing. It has too much gold reflection for me. I would have liked it if the gold had not been so in my face in most angles. Graphite is the one that I thought was good and unique. I typically don't buy this line as I am way too far from any shopping that carries major brands. I also have been pulled in from blogger hype too many times on what is for me, the higher $ end of polishes. 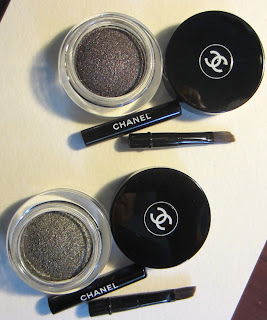 I don't tend to get any Chanel makeup at all again because I am no where near anyplace for 400 miles that has a counter to even look at, and the price tag - I usually can find something in the ranges I am looking for and oft come back to in lines I have better access to. But I like what you bought for yourself - all but the Peridot. Good choices that you can wear on for yrs. I did cave and buy Peridot. It's so beautiful that I couldn't resist! I also love the other two. I've seen some of the shadows on other sites & YouTube. I'm amazed that you could resist it all. 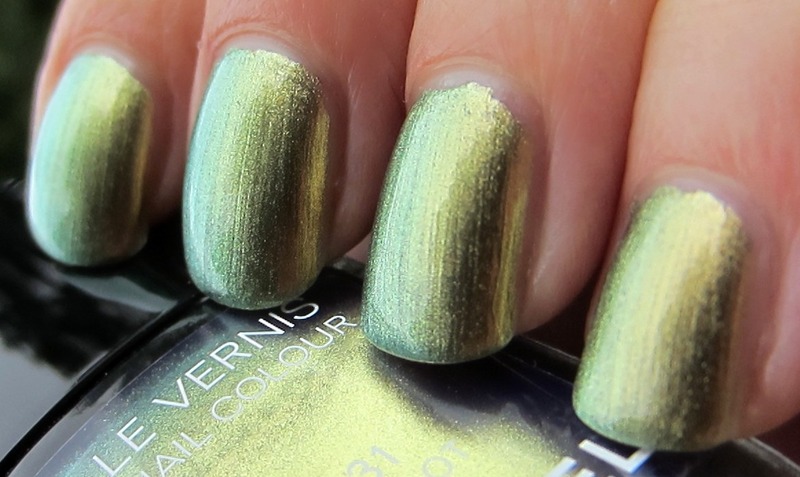 Such lovely shades. The blush is so pretty. Enjoy all your lovely Chanel products. I wish you'd do a makeup look with these new products. I'm sure I'm not alone in wishing you'd do that.